This dressing combines the sweetness of orange juice and the smoky heat of chipotle for a versatile flavor booster. Try this one on warm roasted potatoes or cooked rice, on shredded cabbage, or on fish or chicken. Place the peppers under a broiler or over the gas flame on a gas stove, turning as the skins blacken and blister. When they are evenly blackened, put them in a casserole dish with a lid or a zip-top bag and seal. Let the peppers stand, to steam, for 10 minutes, then remove and let them cool. Using the back of a paring knife, scrape the skin off the peppers, then trim, seed, and if necessary, rinse. Slice in strips and set aside. Put the cubed sweet potatoes in a pot of cold water and bring to a boil. Cook for about 15 minutes, depending on the size of the cubes, or until the potatoes are just tender when pierced with a paring knife. Be careful not to overcook them or they will fall apart. Drain and let cool. 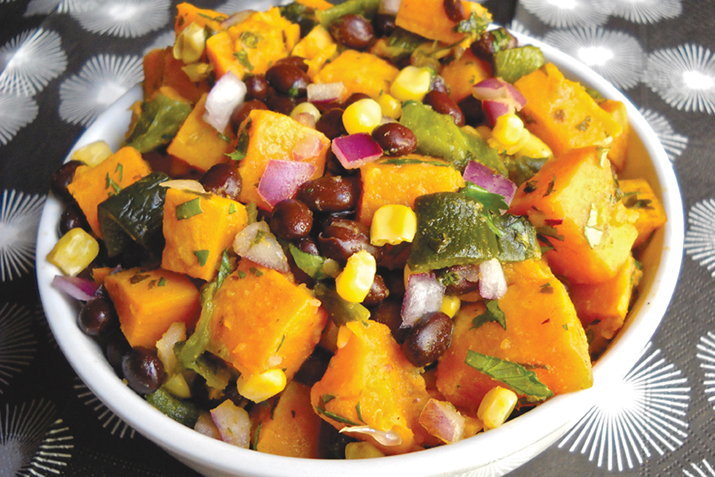 Combine the poblano, sweet potato, black beans, corn, red onions and cilantro and drizzle with the dressing. Serve each with a slice of lime to squeeze over the salad. In a cup or jar, whisk together the oil, orange juice, lime juice, chipotle powder, salt, garlic, and cumin.